This verse from the Torah is a powerful meditation to remind ourselves of God’s presence in every situation. Kabbalah discusses the deep meaning of this verse. One meaning is realizing that nothing in life is a coincidence and that everything happens for a divine reason. Kabbalah explains that God created the world to give infinite goodness and pleasure to all creation. We are spiritually developing to be ready for this goodness. We are developing to a state of pure giving and unconditional love. In this exalted spiritual state we experience the divine goodness that is the source of all reality. We see how all the events of our lives, even the most difficult and painful ones, are hidden blessings helping our souls develop in the ultimate way. Realizing that eternal goodness is the source of everything we go through is, of course, so difficult. Kabbalah discusses the way of developing this higher awareness. Ein Ode Milvado is one of the most powerful meditations we can use throughout our lives. This picture is inspired by a foundational spiritual principle of Kabbalah called Tzimtzum. This principle explains that we experience the limitless pleasure and divine goodness that we were created to experience to the extent that we desire to give. The line coming down from the top of the picture represents the divine goodness and pleasure that is flowing from God every moment. The divine light shines in a state of pure giving. The small rectangle near the center of the picture represents our desire to receive. Since desire to receive is the exact opposite of God’s attribute of pure giving, this disconnects us from experiencing God’s light. The horizontal line above the small rectangle represents striving to transcend our desire to receive. This is the spiritual work of Torah and mitzvot — spiritual learning and practice. 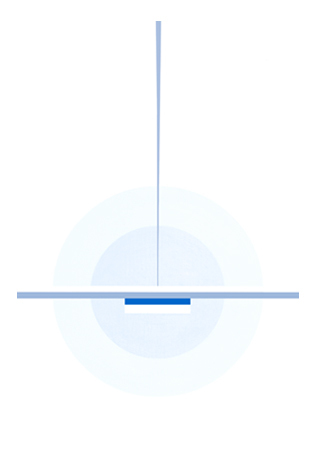 The white space above the horizontal line represents attaining the state of unconditional love and pure giving. This evolution of consciousness brings us to experience the divine goodness. The circles in the painting represent a Kabbalistic concept called Or Makif or Surrounding Light. This concept explains that the divine goodness is always present. Since we can only experience the goodness to the extent that we desire to give, the revelation of the goodness awaits only our inner transformation of consciousness. This means that we are not waiting for God to finally reveal goodness in the world, but rather the already present divine goodness is waiting for us to develop the consciousness of pure giving and unconditional love that can experience it. Experiencing God’s love and goodness is direct light. Returning the love is returning light. A basic principle of Kabbalah is that returning light is the vessel for direct light. This means that we experience God’s giving and love to the extent that we give and love. This picture is a meditation on this foundational spiritual principle of Kabbalah. The principle is simply: In every moment of life, the more we desire to give, the more we are in union with God. Our inner transformation towards attaining divine union in the elevated consciousness of pure unconditional love is the subject of Kabbalah. The spiritual principle of Tzimtzum in relation to our inner spiritual development is discussed in great detail in the holy writings of the master Kabbalists Rabbi Yehudah Leib HaLevi Ashlag z”l and Rabbi Baruch Shalom HaLevi Ashlag z”l. 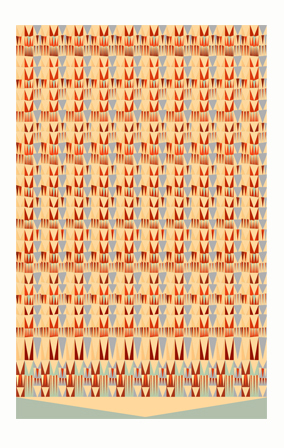 This art depicts the 100 sounds we blow on the shofar on Rosh Hashana. Kabbalah discusses the deep spiritual significance of this pattern of sounds blown since ancient times. This picture depicts the sounds ascending from the bottom. The four different shofar sounds are: tekia, shevarim, terua and tekia gedola. 1 triangle represents the single sound of tekia. 3 triangles represent the 3 shorter sounds of shevarim. 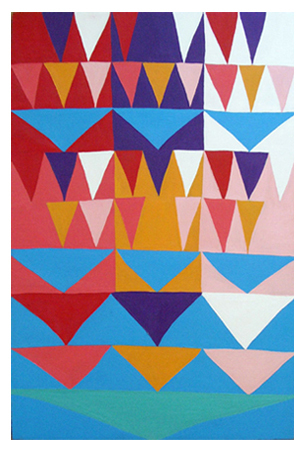 9 triangles represent the 9 very short sounds of terua. The sounds correspond to states of consciousness. The whole long sound of tekia expresses inner joy and thankfulness. The three broken cries of shevarim express brokenness. The sound of terua, so broken it is whole, is the prayer from the depths of our heart revealing the always flowing divine goodness. The very large triangle at the top represents the final very long sound of tekia gedola. This represents unconditional love and oneness. Each of the 100 sounds corresponds to a particular aspect of our inner consciousness. Each progressive sound represents deeper levels of love and spiritual awareness. The final very long sound of tekia gedola represents unconditional love and oneness. The 100 sounds are blown in four sets: three sets of 30 sounds and a final set of 10 sounds. Kabbalah explains that everything we go through in our lives is preparing us to experience infinite divine goodness. This is reflected in the art by the last sound of each set mirror imaging the set of sounds. This represents looking back at our life experiences and seeing how everything was part of a divine plan. The final sound of the fourth set is the extra long sound of tekia gedola. This starts at the exact center of the picture and is represented by reflecting all the shofar sounds from the very beginning. The 100 sounds reflected this way become 366 sounds. This interestingly corresponds to the days of the year. The 100 sounds of the shofar represent ascension of consciousness. Each progressive sound represents deeper levels of love and spiritual awareness. 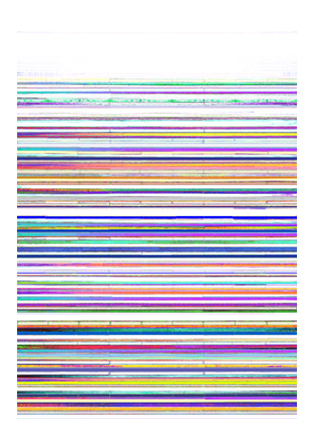 This art is created by sounding the shofar through software that analyses the sound waves. The resulting images inspire this piece. Kabbalah discusses the deep spiritual significance of the sounds of the shofar. One kavana (meditation) of shofar blowing associates the sounds with giving, receiving, balance and oneness. The sounds also correspond to the four letters of the holy divine name י – ה – ו – ה . 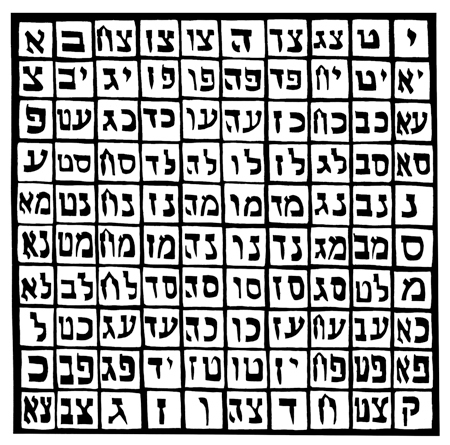 The set of four sounds is repeated 18 times horizontally corresponding to the Hebrew word Chai חי LIFE that has a numerical equivalent of 18. 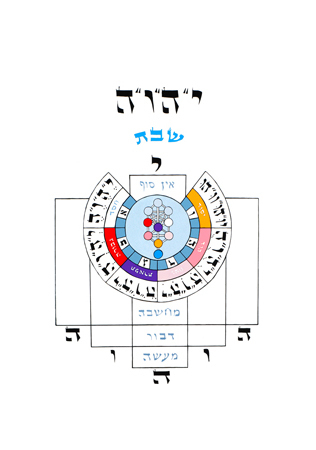 The set of four sounds is repeated ten times horizontally reflecting the ten Sefirot of the Tree of Life — the divine map of spiritual consciousness discussed in Kabbalah. The prayer Ana Bekoach was written about 2000 years ago by the Holy Kabbalist Rabbi Nechunia ben Hakanah. The prayer has profound mystical meaning. The first letters of the 42 words of this prayer are the 42 letter holy name of God. Kabbalah discusses extensively this divine name. The Torah describes 42 encampments in the desert on the way to Israel. This is a secret of 42 stages of spiritual awakening. Also corresponding to this divine name are: 42 words in the first section of the prayer Shema, 42 words in the first section of the prayer Amida, 42 times the four letter name of God is in tefillin, 42 lines in each column of a Torah scroll. The 42 Hebrew letters of the divine name correspond with wings of angels. Angels in Kabbalah are aspects of inner spiritual consciousness. The wings of angels are Love and Awe. Kabbalah has many meditations on Ana Bekoach and the 42 letter holy name. Ana Bekoach is included in the traditional daily prayers in the siddur (prayer book). Please answer us with the great power of Your loving kindness! Free the bound! Accept the songful prayer of Your people! Raise us up! Purify us! Awesome One! Please! Great One! Protect like the pupil of Your eye those who seek Your oneness! Bless them! Purify them! Have mercy on them! Bestow your righteousness on them always! All powerful Holy One! Guide Your community in Your abundant goodness! One and Only! Exalted One! Enlighten Your people who remember your holiness! Accept our prayer! Hear our cry! Knower of secrets! 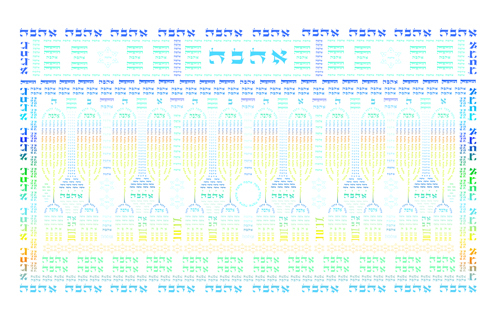 This art is a calendar of the Omer, the seven weeks between the holidays of Pesach and Shevuot. A particular spiritual energy shines on each of these 49 days. These energies correspond to Sefirot in the Tree of Life — the divine map of spiritual consciousness discussed in Kabbalah. The 49 days correspond to the seven Sefirot from Chesed to Malchut within each of the seven Sefirot. In the upper right is a white rectangle representing the Sefira of Chesed. In the upper left is a red rectangle representing the Sefira of Gevurah. 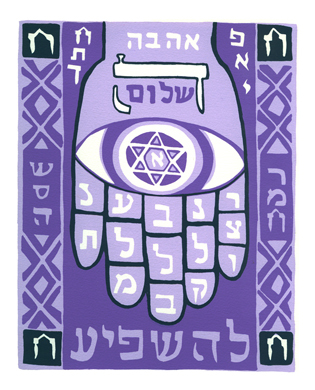 In the upper middle is a purple rectangle representing the Sefira of Tiferet. In the middle right is a rectangle, white with a bit of red, representing the Sefira of Netzach. In the middle left is a rectangle, red with a bit of white, representing the Sefira of Hod. 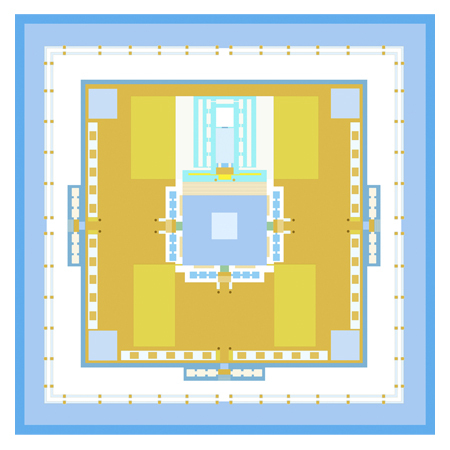 In the middle center is an orange rectangle representing the Sefira of Yesod. The large blue rectangle at the bottom represents the Sefira of Malchut. Each rectangle contains triangles representing the seven Sefirot within the Sefira. The color coding for these Sefirot is the same as before. The triangle of one Sefira is not visible in each area because it is the same color of the Sefira that encompasses it. The spiritual light of each day’s Sefira shines that day. The final 49th Sefira is Malchut of Malchut. This ascends to the exalted spiritual level of Bina. Kabbalah describes this progression as a microcosm of our spiritual development to our ultimate state of unconditional love and divine union. This picture is Psalm 67 by King David. This song envisions the time of all people and nations coming together in harmony. It is a prayer for peace in the world. We have a beautiful tradition to pray this song for peace in the world, reciting it through the shape of the menorah, every evening at sunset and every morning at sunsrise. Please answer me God and shine within me the light of Your love! 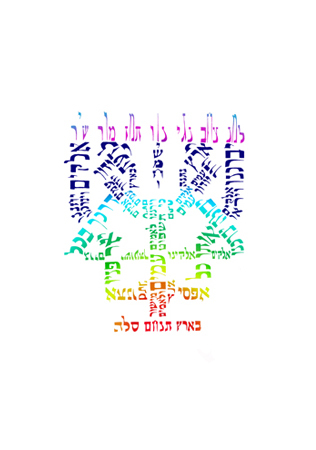 This art is a Kabbalistic song of prayer written by my spiritual teacher Rebbe David Baruch. Kabbalah discusses our spiritual development towards attaining divine union in the elevated consciousness of pure unconditional love. This prayer is a meditation yearning for the divine light of spiritual awakening — praying to truly love. The prayer is in a circle, reflecting the holiness of the circle dance. Dancing in a circle, we dance in each other’s places, realizing our oneness. This painting is inspired by a Kabbalah meditation on the days of the week. Kabbalah explains how the letters of the holy divine name י-ה-ו-ה represent levels of spiritual consciousness. In this meditation, the letter י corresponds with Shabbat שבת. Sunday and Friday clothe the י of Shabbat and correspond to the upper ה of י-ה-ו-ה . Monday and Thursday clothe the upper ה and correspond to the ו.
Tuesday and Wednesday clothe the ו and correspond to the lower ה. The spiritual essence of Shabbat manifests in the first three days of the week. The next three days elevate to the spiritual essence of the coming Shabbat. 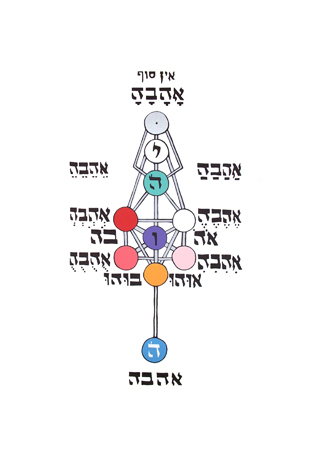 Kabbalah describes the four letters of the divine name in greater detail as ten Sefirot — the Tree of Life. A map of the Tree of life is in the center of the picture. The spiritual energy of a particular Sefira shines each day. In the circle surrounding the Tree of Life are Sefirot corresponding with the days of the week. The days also correspond spiritually with colors and sounds. Next to each day is the divine name with the sound notation corresponding to that day and state of spiritual consciousness. We do not pronounce these holy names. They are used in meditation. Kabbalah discusses the spiritual elevation of our actions, speech and thoughts to giving and unconditional love. This meditation is one of many intensely beautiful meditations described in the Ari z”l’s Sha’ar Ruach HaKodesh, The Gate of Prophecy. The Tree of Life is the divine map of spiritual consciousness discussed in Kabbalah. These 10 aspects of our inner self and levels of divine experience are called Sefirot. Kabbalah has thousands of pages of spiritual wisdom discussing the Tree of Life. The Tree of Life describes how we are spiritually developing to experience the infinite goodness at the source of reality. As we spiritually develop to deeper levels of giving and love, we ascend to higher levels of divine awareness. The Tree of life is comprised of 3 columns. The right side corresponds with giving. The left side corresponds with receiving. The center is balance and oneness. 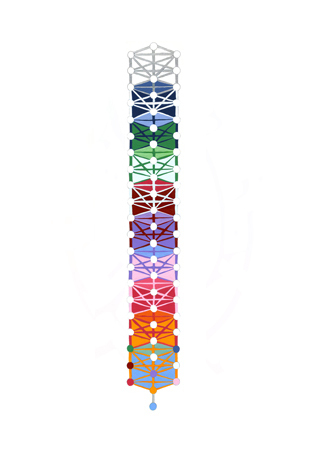 The 22 connecting lines between the Sefirot represent particular channels of spiritual energy. These correspond to the 22 Hebrew letters. The 10 Sefirot correspond to aspects of our physical bodies, inner consciousness, and all reality. Each of the Sefirot contains within itself all of the Sefirot. The Tree of Life describes our spiritual progression to unconditional love and divine union. The 10 Sefirot correspond to aspects of our physical bodies, our inner consciousness, and all reality. Each of the Sefirot contains all of the Sefirot. 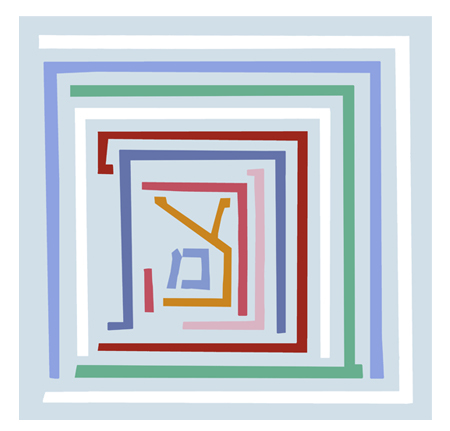 This picture depicts 10 Sefirot of each of the 10 Sefirot clothed within each other. The Keter of each Sefira clothes Tiferet of the Sefira above. 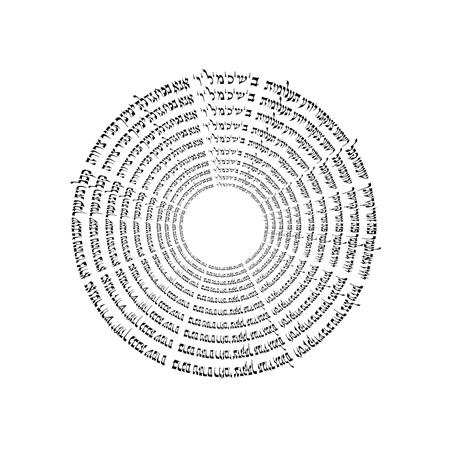 This art depicts the 100 sounds we blow on the shofar on Rosh Hashana reflected through the Tree of Life. The Tree of Life is the divine map of spiritual consciousness discussed in Kabbalah. These 10 aspects of divine experience are called sefirot. 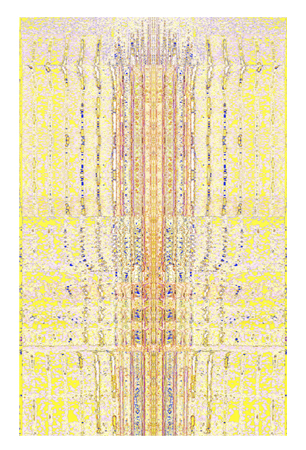 This art represents the 100 sounds of the shofar shining through the 10 sefirot to reveal 1000 sounds of the shofar. 10 triangles represent the 10 sefirot of the single sound of tekia. 30 triangles represent the 30 sefirot of the 3 shorter sounds of shevarim. 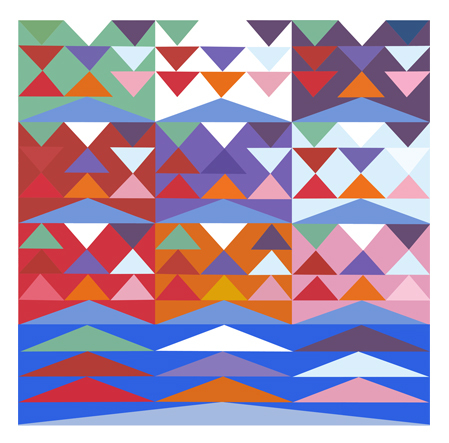 90 triangles represent the 90 sefirot of the 9 very short sounds of terua. Each of the shofar sounds corresponds to a particular aspect of our inner consciousness. Each progressive sound represents deeper levels of love and spiritual awareness. The very long sound of tekia gedola represents unconditional love and oneness. The depiction of the sounds begins with the triangle at the top right and descends to the bottom. The next set of sounds begins with the second triangle from top right and descends to the bottom. The third set of sounds begins with the third triangle from the top right and descends to the bottom. This concludes a set of 100 shofar sounds. 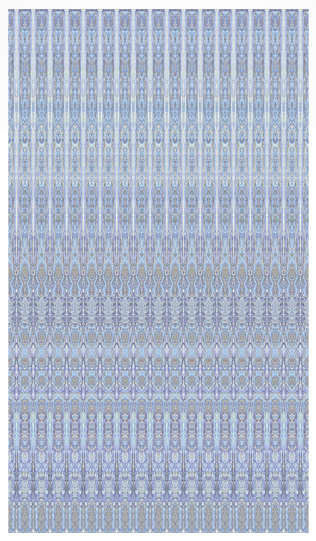 The mapping in three columns reflects the sounds correspondence to giving, receiving and balance. The mapping is repeated ten times reflecting the ten Sefirot of the Tree of Life. The ten sets shares the extra long sound of tekia gedola represented by the large triangle at the bottom. Each shofar sound corresponds to a particular aspect of our inner consciousness. Each progressive sound represents deeper levels of love and spiritual awareness. Every word in this picture is אהבה LOVE. This art is inspired by a traditional form of Kabbalah art called Shiviti. A Shiviti has the four letters of the holy name of God י – ה – ו – ה in large letters near the top of the picture. The rest of the picture is composed of other divine names, holy verses, and prayers. The four letters of the word אהבה LOVE are very similar to the four letters of י-ה-ו-ה . The two letters ה are the same in both. The letter י represents a single point, like א that is the number one. The letter ו and the letter ב have similar sounds. This Shiviti is composed entirely of אהבה. It is a meditation on the divine unconditional love that is the source of our every moment. 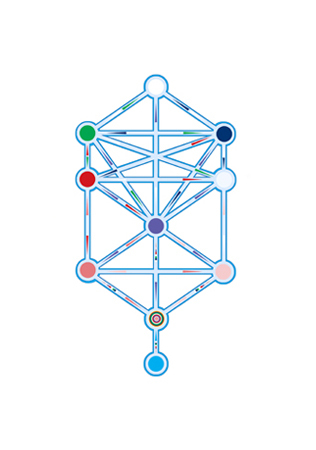 This art depicts the 10 Sefirot of the Tree of Life within the 10 Sefirot. The Tree of Life is the divine map of spiritual consciousness discussed in Kabbalah. These 10 aspects of our inner self and levels of divine experience are called Sefirot. Each of the Sefirot contains within itself all of the Sefirot in various combinations of direct light and returning light. The top middle square represents the highest Sefira KETER. 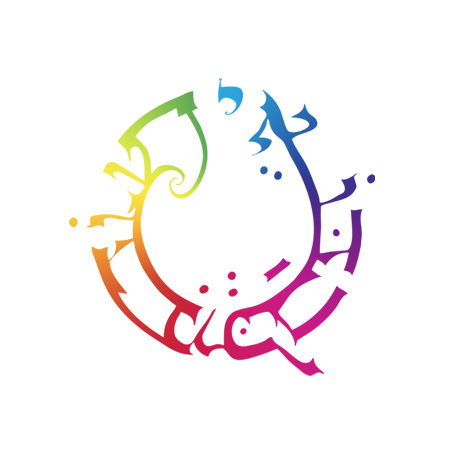 The top right square represents CHOCHMA. The top left square represents BINA. The middle right square represents CHESED. The middle left square represents GEVURAH. The middle center square represents TIFERET. The lower right square represents NETZACH. The lower left square represents HOD. The lower middle square represents YESOD. 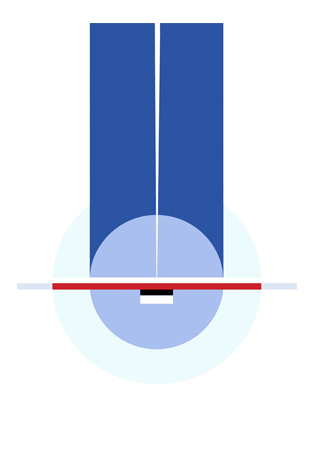 The rectangle at the bottom represents MALCHUT. Each of the 10 Sefirot contains 10 triangles representing the 10 Sefirot within itself. The color coding of these Sefirot is the same as before. Triangles representing direct light point down. Triangles representing returning light point up. KETER has 9 direct lights and 1 returning light. CHOCHMA has 8 direct lights and 2 returning lights. BINA has 7 direct lights and 3 returning lights, and so on until MALCHUT with 10 returning lights. This painting is inspired by a passage from the monumental Kabbalah work Talmud Eser Sefirot by the holy Rebbe Yehudah Leib HaLevi Ashlag z”l. 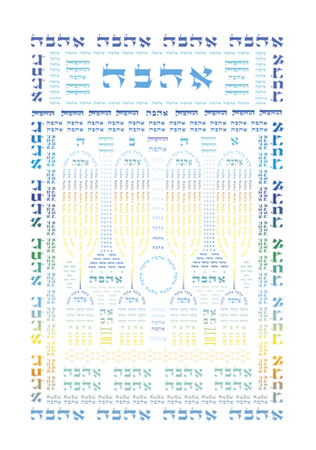 This art depicts the 12 possible permutations of the holy name of God י-ה-ו-ה. Each month of the year corresponds spiritually to one of these permutations. The Hebrew months correspond to the cycle of the moon. When the moon appears at sunset as its smallest crescent, it is the first day of the new Hebrew month. When the moon is full, it is the middle day of the month. When the moon reappears again as a tiny crescent, it is the first day of the next month. Each month corresponds to a particular spiritual energy and aspect of consciousness. The spiritual energies of the 12 months of the year correspond to the 12 permutations of the divine name. A Kabbalah meditation is to meditate each month on the corresponding permutation of the divine name. The month of Nisan is associated with the normal order of the name depicted at the top center of the picture. The permutations continue in the order of the months counterclockwise. On the final month of Adar, the meditation is on all 12 of the permutations together. These permutations are hidden in the first and last letters of verses in the Torah. The vowel notations with the holy names are the vowels of the letters in the corresponding verses from the Torah. We do not pronounce these holy names. They are used in meditation. This cycle of spiritual progression also happens every day as the 12 permutations also correspond to the 12 hours of the day and 12 hours of the night. Kabbalah describes how this cycle of spiritual progression is a microcosm of our spiritual development to our ultimate state of unconditional love and divine union. This picture is about giving, receiving and oneness. It depicts the two letters hey ה in the holy name of God י-ה-ו-ה. The upper ה represents our desire to give. The lower ה represents our desire to receive. Kabbalah explains that since our divine source is only giving and has no need or desire to receive, we experience our divine source to the extent that we desire to give. Our lower ה ascending to our upper ה represents our spiritual awakening to pure giving and unconditional love. This inner transformation enables us to experience the infinite goodness that is the source of all reality. As we attain deeper levels of giving and love, we attain deeper levels of divine union. The two letters ה of the divine name are depicted and the י and the ו are implied: the ו being the spiritual work of inner transformation, and the י as the infinite unconditional love at the root of our every moment. The three shorter sounds of shevarim also correspond to giving, receiving and balance. Vav with a dot on top represents tekia. 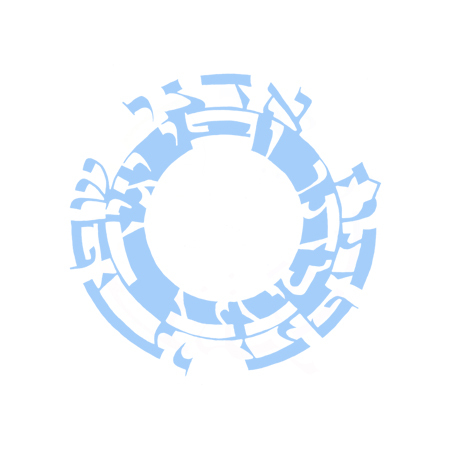 Vav with a dot in the middle represents shevarim. Vav with a dot underneath represents terua. The large vav represents the very long sound of tekia gedola. This represents unconditional love and oneness. A single line represents the single sound of tekia. A line divided into three short segments represent the 3 shorter sounds of shevarim. A line divided into nine very short segments represents the 9 very short sounds of terua. The large space at the top represents the final very long sound of tekia gedola. This represents unconditional love and oneness. Colors and sounds have spiritual roots in the Tree of Life and are used in Kabbalah meditations. The sound notation that corresponds to each Sefira is depicted in this picture with the word אהבה AHAVA LOVE. As we spiritually ascend, we attain deeper and deeper experiences of love. This painting is a meditative map of many spiritual concepts of Kabbalah. At the center of the painting are four Hebrew letters א ה ב ה meaning LOVE. The more we develop spiritually, the more we become able to experience the always present divine love that is the source of all reality. The Kabbalah describes our spiritual progression towards becoming a vessel that is able to experience the infinite light of divine goodness and pleasure that we were created to experience. 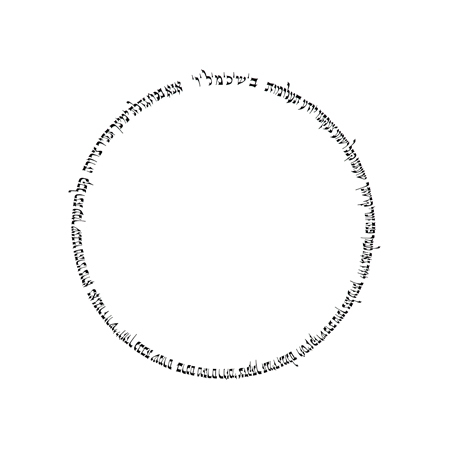 At the top of the next circle are the letters את. This holy divine name corresponds with unconditional love and experiencing the divine presence. These two letters are the first and and last letters of the Hebrew alphabet. Kabbalah explains that every Hebrew letter represents a particular spiritual energy. In the rest of the circle is an ancient script of the Hebrew alphabet. The next circle contains a star of David. A star of David is made of a triangle going down and a triangle going up. The triangle going down represents “direct light” and the triangle going up represents “returning light.” Experiencing God’s love and goodness is called direct light. Returning the love is called returning light. A basic principle of Kabbalah is that returning light is the vessel for direct light. This means that we experience God’s giving and love to the extent that we give and love. The union of the two triangles also represents the unification of physical and spiritual reality. The six points of the star also represent the six weekdays and the center of the star represents Shabbat. Every Friday night before sundown the celebration of Shabbat begins with lighting candles. Until after sundown the next night, Shabbat is celebrated as an elevated spiritual day. The Jewish people have been celebrating Shabbat every week for thousands of years. In the top triangle of the star are three Hebrew letters yud י – י – י. This is one of 72 three letter divine names discussed in Kabbalah. Each divine name corresponds with a particular spiritual energy. This name corresponds to a very holy blessing of peace from the Torah. In Israel, cohanim chant this ancient blessing during the traditional meditation prayer every morning at sunrise. There is a beautiful tradition for parents, on Shabbat evening, to place their hands on their children’s heads and bless them every week with this special blessing. GOD! OPEN MY LIPS, AND MY MOUTH WILL SPEAK YOUR PRAISE. This verse is from the Psalms of King David and has profound mystical meaning. These words are the opening to the traditional silent meditation called Amida. This ancient meditation takes place three times a day: sunrise, sunset and nighttime. The focus of the meditation is being intimately in the presence of God. The meditation begins with whispering this verse, reminding ourselves that God is the source of everything, including our thoughts and prayers. This mystical verse from the ancient prophet of Israel, Zechariah, is recited at the end of each of the three traditional daily meditations. This verse is a prayer for our personal awakening and the awakening of the entire world to our divine oneness. In the left of the circle is שסה. 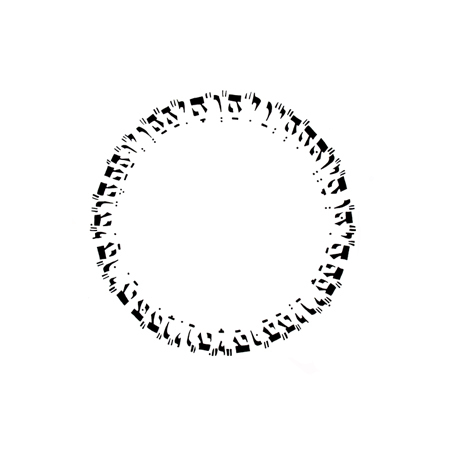 In the right of the circle is רמח. Every Hebrew letter represents a number and the numerical equivalents of these two divine names are 365 and 248. Together this comes to 613 and reflects the 613 spiritual practices of the Torah called mitzvot. 365 mitzvot focus on developing our ability to overcome receiving in a way that is only self-serving. 248 mitzvot focus on developing our elevated consciousness of pure giving and unconditional love. Each of the 613 mitzvot corresponds to a particular aspect of our souls and our physical bodies. The spiritual practice of mitzvot purifies our bodies and souls to be in spiritual alignment with the flow of divine energy. 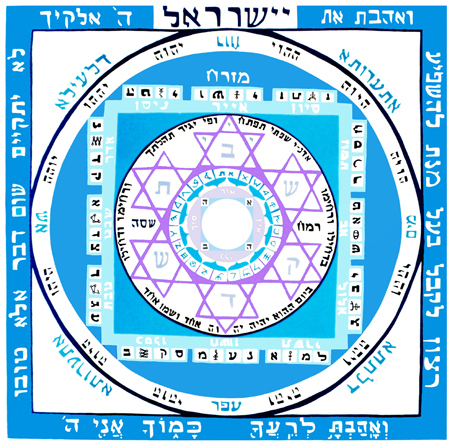 Continuing outwards, the blue square surrounding the circle contains the names of the twelve Hebrew months of the year. The Hebrew months correspond to the cycle of the moon. When the moon appears at sunset as its smallest crescent, it is the first day of the new Hebrew month. When the moon is full, it is the middle day of the month. When the moon reappears again as a tiny crescent, it is the first day of the next month. Each month corresponds to a particular spiritual energy and aspect of consciousness. The Hebrew months each have associations with specific planets, stars, and spiritual energies of Hebrew letters. The twelve months also correspond with the twelve tribes of Israel. The four small white squares next to each month depict the tribe, planet, stars, and Hebrew letter that correspond with that month. The square on the left contains the first letter of the tribe. The next square contains a mystical symbol of the planet. The next square contains the first letter of the star sign. The last square on the right contains the Hebrew letter that corresponds with the spiritual energy of the month. About 3500 years ago the twelve tribes of Israel traveled in the Sinai desert for forty years in a majestic encampment. The tribes camped in alignment with spiritual energies in an exalted state of divine awareness. Kabbalah explains that each of the twelve tribes corresponds to a different aspects of every person’s inner consciousness, and that the encampment contains deep insight into our personal attainment of inner spiritual alignment. The encampment reflects a microcosm of spiritual design in the universe as well as a macrocosm of our inner consciousness. The position of each tribe in this painting is that tribe’s position in the encampment. A foundational teaching of Judaism is oneness, so why individual tribes? Judaism’s perspective of oneness is not that we are all the same, but rather that we are each unique reflections of God’s light. Every single person has a unique and important role to play in the world that nobody else can do. The goal is not for us all to be the same, but rather each of us, as well as every tribe and nation, spiritually developing to shine our own special light in the world. The encampment gives us insight into oneness as an inter-dynamic relationship of many integral parts, each attaining its unique spiritual expression, working together harmoniously. The top of the painting is the eastern direction of the encampment. At the top of the blue circle is מזרח meaning EAST. East is the direction of the sunrise and symbolizes our awakening to the divine light. The Jewish people have been praying every day for 2000 years to return from exile to the land of Israel. The ingathering from all over the world of the twelve tribes of Israel, millions of people, is miraculously happening before our very eyes, in accordance with the ancient prophecies. Right corresponds with giving and appreciation. This is associated with water. Left corresponds with receiving and lack. This is associated with fire. Kabbalah discusses the spiritual work of balancing these opposing aspects. Above and below, associated with wind and earth, represent another dimension of these aspects of our inner selves that we strive to unify through spiritual practice. Kabbalah explains how the letters of the holy divine name י-ה-ו-ה represent aspects of spiritual reality and aspects of our inner consciousness. There are twelve possible permutations, ordering of the letters, of the divine name. 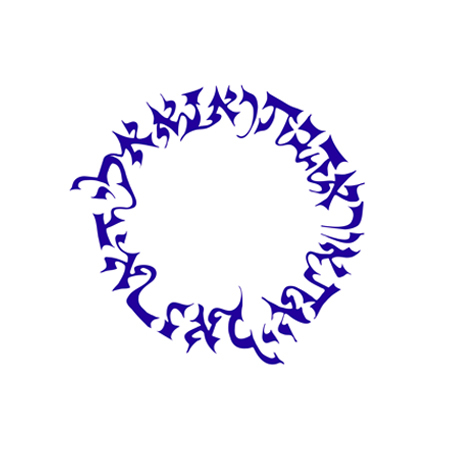 In the thin white circle that contains the four elements are the twelve permutations of the divine name. Each of these permutations corresponds to the spiritual energy of a particular month. The four letters of the divine name י-ה-ו-ה are very similar to the four letters of the word א-ה-ב-ה LOVE. The two letters ה are the same in both. The letter י represents a single point, like א that is the number one. 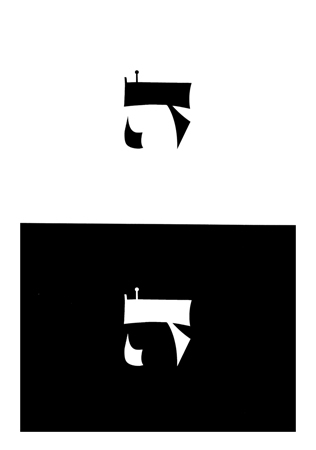 The letter ו and the letter ב have similar sounds. Awakening from above is a term used in Kabbalah that expresses our being gifted with divine experience. Awakening from below is when we strive to return the love. Shabbat is an example of awakening from above. Lighting Shabbat candles is an example of awakening from below. Every awakening from below brings us to experience an awakening from above more deeply. Kabbalah explains that God created the world to give infinite goodness and pleasure to all creation. This pleasure is temporarily concealed from us while we are undergoing inner transformations of consciousness preparing us to experience the goodness. When we complete our spiritual evolution, we become able to experience the divine and eternal goodness at the root of all reality. We come to see how all the events of our lives, even the most difficult and painful ones, were hidden blessings divinely designed to help our souls develop in the most ultimate way. Our spiritual development towards being able to receive God’s goodness in a state of giving and divine union is discussed extensively by the holy Kabbalah master Rebbe Yehudah Leib HaLevi Ashlag z”l. Kabbalah explains that striving to love others as we love ourselves is essential to attaining the exalted spiritual level of divine experience and love for God. In the upper center of the painting is יישרראל ISRAEL with the letters י and ר written twice. The holy Kabbalah master the Arizal explains that a secret of the word ישראל is that it is the first Hebrew letters of the names of our holy ancestors Avraham, Yitzchak, Yakov, Sarah, Rivka, Rachel, and Leah. Kabbalah explains that each person in the Torah represents a different aspect of our spiritual psychology. The stories, conversations and happenings in the Torah are not just historical events, but are actually describing what is happening within ourselves this very moment. An inner dimension of the Torah is a map of consciousness describing the path of spiritual awakening and inner transformation. Every verse of the Torah provides different details of the same story: our spiritual journey towards unconditional love and divine union. The word ישראל ISRAEL is comprised of two Hebrew words: ישר means connection and א“ל is a divine name associated with giving and love. When we are striving to connect with our divine source through giving and love, we are in the spiritual land of Israel. The Torah describes the journey of the Jewish people to the land of Israel. This journey can also be understood in an inner way as the collective journey of all humanity — the spiritual awakening of all consciousness to unconditional love and divine awareness. The verse in this picture is from the Psalms of King David. The traditional silent meditation Amida begins with whispering these words. This meditation takes place three times a day: sunrise, sunset and nighttime. The focus of the meditation is being intimately in the presence of God. Kabbalah discusses many profound mystical meanings of this verse. The verse is a prayer for our prayer — the realization that God is the source of everything, including our prayer. This painting is inspired by the third Temple described by the prophet Yechezkel over 2500 years ago. Kabbalah explains that the design of the Temple reflects our inner self. The stairs, walls, rooms, windows, doors, gates, vessels, water, fire, clothing, musical instruments, and rituals of the Temple all reflect aspects of consciousness. In the divine presence, the entire world experiences our oneness. The Temple is built with unconditional love. It is made of our prayers and acts of loving kindness. This art is based on a drawing in the book Pardes Rimonim written about 500 years ago by the holy Kabbalist Rabbi Moshe Cordovero. The drawing is the first letters of the Sefirot of the Tree of Life inside of each other. A chapter in Pardes Rimonim discusses various color associations with the Sefirot. The colors in this picture correspond to one of these. Each row in this square adds up to the name Sarah. The numerical equivalent of שרה Sarah is 505. The ten horizontal rows, ten vertical rows and two diagonal rows each add up to 505. This square is used in a very advanced meditation discussed by Kabbalist Rabbi Yosef Tzayach about 500 years ago. A horizontal row is called a house. A number is called a room. In meditation, a person inwardly travels from room to room and house to house. Each room contains millions of colored lights and millions of miles of space. Rabbi Tzayach writes that the reason for the numbers in each room are among the deepest mysteries. The Tree of Life is the divine map of spiritual consciousness discussed in Kabbalah. As we spiritually develop to deeper levels of giving and love, we ascend to higher levels of divine awareness. The Tree of Life contains ten aspects of our inner self and levels of divine experience called Sefirot. Each of the Sefirot contains all of the Sefirot. The Sarah meditation square is ten by ten. This corresponds to the ten Sefirot within the ten Sefirot. The Sefirot are connected by 22 channels of spiritual energy corresponding to the 22 letters of the Hebrew alphabet. 22 rows in this square add up to Sarah. Sarah is a holy divine name corresponding to an exalted state of unconditional love and divine union. The Sarah square can be used to meditate on the inner spiritual aspect that Sarah represents — the unconditional love and divine joyfulness always shining in the deepest place in our hearts. This picture is the open hand of giving. The eye represents looking at the good in everything. As the divine source of reality is giving, the more we are giving, the more we are in divine union. Kabbalah discusses our progression to an exalted spiritual state where even our receiving is in order to give. On top of the hand is: אהבה LOVE and שלום PEACE. The Hebrew letter ה surrounding the word שלום represents the divine presence. We experience the divine presence when we are giving. These two divine names correspond with spiritual awareness and are used in meditations. In each corner is the Hebrew letter ח . This letter corresponds to transcendence and miracles — transcending self-interest to purely give with unconditional love. Every Hebrew letter is also a number. The numerical equivalents of these two divine names are 365 and 248. Together this comes to 613 and reflects the 613 spiritual practices of the Torah called mitzvot. 365 mitzvot focus on developing our ability to overcome receiving in a way that is only self-serving. 248 mitzvot focus on developing our elevated consciousness of pure giving and unconditional love. Kabbalah explains that we are all in the process of spiritually developing to become able to experience eternal divine goodness. The more we are giving and thankful, the more we experience the goodness. The spiritual principle of Tzimtzum in relation to our inner spiritual development is discussed in great detail in the holy writings of the master Kabbalists Rabbi Yehudah Leib HaLevi Ashlag z”l and Rabbi Baruch Shalom HaLevi Ashlag z”l. 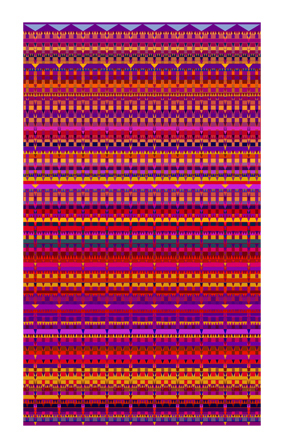 For more information see A Tapestry for the Soul by Rabbi Ashlag.